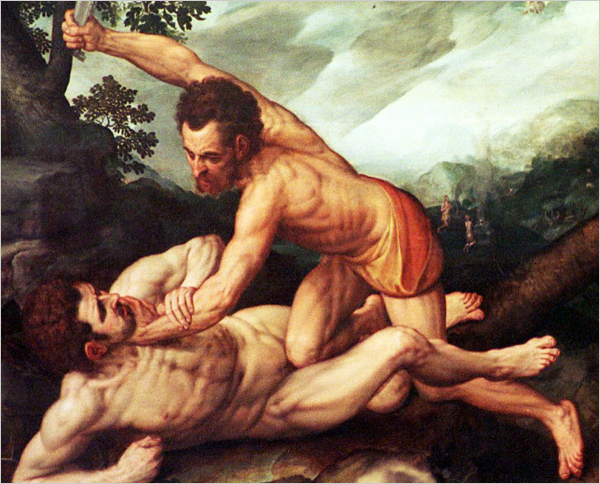 1 Timothy 4:1-2, “Now the Spirit expressly says that in latter times some will depart from the faith, giving heed to deceiving spirits and doctrines of demons, speaking lies in hypocrisy, having their own conscience seared with a hot iron, forbidding to marry, and commanding to abstain from foods which God created to be received with thanksgiving by those who believe and know the truth. The Holy Bible warns of latter times when many will depart from the Faith. 1 Timothy 4:1-2, describes a great falling away from not only The Cross of Christ but God in general. We can see this today in the American society where to accommodate other cultures with different beliefs, we compromise our own mainly by not sharing our Faith. While we are here operating in the natural world we must share our belief in Christ, in saying we belong to the Most High and share the revelation of Jesus Christ so that others may be saved, 2 Timothy 1:8. The further we move away from the Cross, the closer we are to receiving a lie, and offer ourselves over to Satan the god of this world. It seems today the only time we here about Christ it is when politicians are running for office our an athlete wins a championship. Then we wonder why there is so much terror and sin rampant in the world. Terror breeds fear and fear is not of The Lord. 2 Timothy 1:8 reads, “For God gave us a spirit not of fear but of power and love and self-control.” In these latter times, we must hold on to our faith and confess Jesus Christ as the Savior. Doing do will ward off the enemy from your life, family, and Spiritual well being. Pray that the world will no longer turn away, but turn to the Cross of Jesus Christ for salvation. The plan of the enemy will not win in blinding this generation into believing a lie but rather the truth. For God so loved the world that He gave his only begotten Son, Jesus! 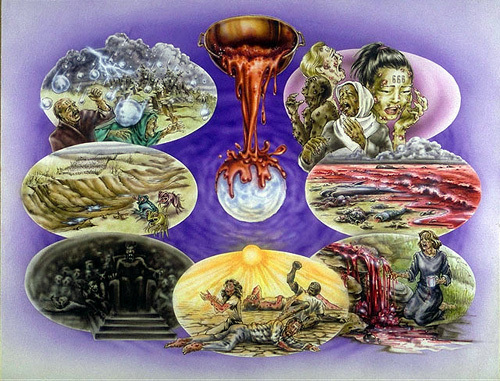 Soon after the opening of the 7 Seals of Revelations , the 7 trumpets of judgement will sound upon the Earth. The 1st trumpet (Revelation 8:7) will bring about great destruction upon the land very similar to the seventh plague upon Egypt in Exodus 9:22 mainly effecting the Middle East as well as a great part of the rest of the World. This destruction upon the vegetation of the Earth will be a fulfillment of a prophecy found in Joel 2:30-32. The 2nd trumpet which sounds will cause a “great burning mountain,” to be cast into the sea (Revelation 8:8-9) This “great mountain,” will be a meteorite which will fall from space to contaminate the Earth’s body of waters causing a discoloration of the sea and causing death of much of the sea life in the world today. The 3rd trumpet (Revelation 8:10) sounded by the Angels of God will cause another meteorite to fall to the Earth by the name Wormwood. Wormwood was a toxic plant from the Old Testament, found in Jeremiah 9:15 (NKJV), “therefore thus says the LORD of hosts, the God of Israel: “Behold, I will feed them, this people, with wormwood, and give them water of gall to drink.” This contamination of the Earth’s water will cause mass death in the surrounding area. The 4th trumpet is described in Revelation 8:12-13 (NKJV), “Then the fourth angel sounded: And a third of the sun was struck, a third of the moon, and a third of the stars, so that a third of them were darkened. A third of the day did not shine, and likewise the night. And I looked, and I heard an angel flying through the midst of heaven, saying with a loud voice, “Woe, woe, woe to the inhabitants of the earth, because of the remaining blasts of the trumpet of the three angels who are about to sound!” The blocking out of the sun always represents a strong judgement which is being handed out by God, foretold by Jesus in Luke 21:25-26. The three “woes,” represent the last three trumpets to sound upon the Earth. the 5th trumpet in Revelations 9:1-4 (NKJV) reads, “Then the fifth angel sounded: And I saw a star fallen from heaven to the earth. To him was given the key to the bottomless pit. And he opened the bottomless pit, and smoke arose out of the pit like the smoke of a great furnace. So the sun and the air were darkened because of the smoke of the pit. Then out of the smoke locusts came upon the earth. And to them was given power, as the scorpions of the earth have power. They were commanded not to harm the grass of the earth, or any green thing, or any tree, but only those men who do not have the seal of God on their foreheads.” The falling star here is Satan who is cast out of Heaven in order to open the bottomless pit. Satan will release demonic spirit in the form of locusts and scorpions upon those who chose the Anti-Christ instead of Christ in the end time. God gives orders to not destroy the land but those who have the seal of The Beast on their foreheads. This will be a great time of torment upon the unsaved who believed a lie instead of the truth of Jesus Christ, Revelations 9:6 says many will seek death but will not find it at this time showing the end result of disobedience from God. The 6th trumpet (Revelation 9:13-21) represents the second woe of the angel of God. At this time 4 powerful evil fallen angels will be released from the Euphrates river to execute God’s wrath. The discerning of the times we live in is very important to every believer in the Christian faith to understand. This is for us to be able to see and warn people and prepare ourselves as well for the coming Tribulation and eventual Rapture of the Church of Christ. The book of Revelation is very clear on the events which will lead into the Kingdom Age of Christ with the first being the revealing of the 7 Seals. The beginning of the end (Tribulation period) begins with the revealing of the great mystery of God. Only the Lamb of God (Jesus) is the one justified and none corrupted to open the 7 Seals to end this Earth Age. The 1st Seal opened in Revelation 6:1-2, states “And I saw when the Lamb opened one of the seals, and I heard, as it were the noise of thunder, one of the four beasts saying, Come and see. And I saw, and behold a white horse: and he that sat on him had a bow; and a crown was given unto him: and he went forth conquering, and to conquer.” This “white horse,” is symbolic of the Anti-Christ who while enter the world stage, who will present Himself as a peace keeper but will reveal Himself to be something much worse. The “bow,” represents that he will speak peace but plot war with the “crown,” representing His many conquered nations. The 2nd Seal opened in Revelation 6:3-4 reads, “And when he had opened the second seal, I heard the second beast say, Come and see. And there went out another horse that was red: and power was given to him that sat thereon to take peace from the earth, and that they should kill one another: and there was given unto him a great sword.” The “red horse,” represents war and “power given unto Him,” means the Anti-Christ will be given authority to destroy many at this time. The 3rd Seal opened in verse 6:5-6 reveals, “And when he had opened the third seal, I heard the third beast say, Come and see. And I beheld, and lo a black horse; and he that sat on him had a pair of balances in his hand. And I heard a voice in the midst of the four beasts say, A measure of wheat for a penny, and three measures of barley for a penny; and see thou hurt not the oil and the wine.” The “black horse,” here is famine and the balances are symbolic of little or no food being available to those in this part of the world, and the grave cost of each. The 4th Seal in Revelations 6:7-8,”And when he had opened the fourth seal, I heard the voice of the fourth beast say, Come and see. And I looked, and behold a pale horse: and his name that sat on him was Death, and Hell followed with him. And power was given unto them over the fourth part of the earth, to kill with sword, and with hunger, and with death, and with the beasts of the earth.” The “pale horse,” is revealed to be death, meaning all those who had been slain at this time are destined for Hell. The 5th Seal in Revelation 6:9-11, “And when he had opened the fifth seal, I saw under the altar the souls of them that were slain for the word of God, and for the testimony which they held: And they cried with a loud voice, saying, How long, O Lord, holy and true, dost thou not judge and avenge our blood on them that dwell on the earth? And white robes were given unto every one of them; and it was said unto them, that they should rest yet for a little season, until their fellowservants also and their brethren, that should be killed as they were, should be fulfilled.” The 5th Seal speaks of the Christians martyred for their Faith at this time. They will pray for judgement on the Lawless one (Anti-Christ), for His actions at this time, which will soon be carried out by God. The 6th Seal in Revelation 6: 12-17, states “And I beheld when he had opened the sixth seal, and, lo, there was a great earthquake; and the sun became black as sackcloth of hair, and the moon became as blood; And the stars of heaven fell unto the earth, even as a fig tree casteth her untimely figs, when she is shaken of a mighty wind. And the heaven departed as a scroll when it is rolled together; and every mountain and island were moved out of their places. And the kings of the earth, and the great men, and the rich men, and the chief captains, and the mighty men, and every bondman, and every free man, hid themselves in the dens and in the rocks of the mountains; And said to the mountains and rocks, Fall on us, and hide us from the face of him that sitteth on the throne, and from the wrath of the Lamb: For the great day of his wrath is come; and who shall be able to stand?” Represents the first of many earthquakes upon the Earth, which will result in the sun being blotted out from the dust of the land followed by meteorite showers upon the the Earth, causing severe damage similar to that of Sodom and Gomorrah. After this time the restoration of Israel will begin as well as the tribulation Saints who gave their lives during this time, who will cry and thank Jesus for their salvation.